Massive clouds of smoke formed from the fires of Fort McMurray, Alberta, Canada, caused respiratory illnesses in communities more than 1,000 miles away. Newly published research identifies the western U.S. counties with the highest risk of exposure to pollution from wildfires. Wildfires threaten more than land and homes. The smoke they produce contains fine particles (PM2.5) that can poison the air for hundreds of miles. 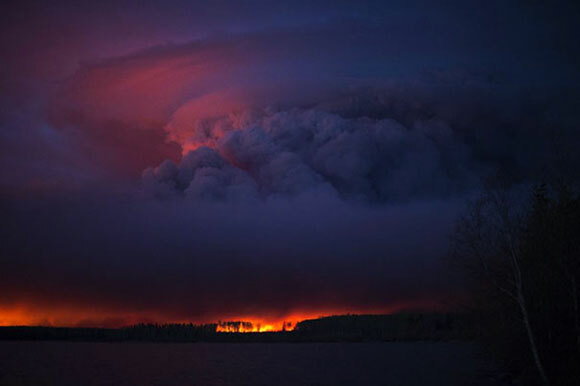 Air pollution from the 2016 Fort McMurray fire in northern Alberta, Canada, sent people as far away as Michigan to the hospital with respiratory illnesses. As wildfires increase in frequency and severity due to climate change, more and more communities are at risk of prolonged exposure to harmful levels of smoke. Harvard University researchers, in collaboration with colleagues at Yale University, have created a watch list of hundreds of counties in the western United States at the highest risk of exposure to dangerous levels of pollution from wildfires in the coming decades. Among them, heavily populated counties such as San Francisco County, Calif., King County, Wash., Alameda County, Calif., and Contra Costa County, Calif., are projected to face the highest level of risk of wildfire smoke exposure in the coming decades. The research is described in the journal Climatic Change. To identify the areas at highest risk, the team used a fire-prediction model and advanced atmospheric modeling to differentiate pollution caused by wildfires from other pollution sources and track the likely movement of smoke. The team coined a new term, “smoke wave,” to describe two or more consecutive days of unhealthy levels of PM2.5 from fires. The study found that across the western United States, climate change will likely cause smoke waves to be longer, more intense, and more frequent. Of the 561 counties studied, 312 are expected to have more intense smoke waves in the next 30 years. The team found that between 2004 and 2009, about 57 million people in the western United States experienced a smoke wave. Between 2046 and 2051, the team estimates that more than 82 million people will likely be affected, mostly in northern California, western Oregon, and the Great Plains, where fire fuel is plentiful. The team estimated that about 13 million more children and seniors — who are at higher risk for respiratory illness — will be affected by smoke waves than are today. “In the coming decades, we will be seeing the significant human health consequences from these extreme events in a changing climate,” said Jia Coco Liu, a recent Ph.D. graduate of the Yale School of Forestry and Environmental Studies and first author of the paper. But it’s not just the future that worries health officials. Do Community Factors Affect Your Weight? 2 Comments on "New Study Shows ‘Smoke Waves’ Will Affect Millions in the Coming Decades"
The problem is, that there are too many people in this world. Overpopulation causes a lot of problem. Not only air pollution and global warming, but also water pollution, mass extinction of animal species, increasing difficulties to supply water and food, increased emergence of new epidemics and pandemics, elevated crime rate, and so on. If we were able to solve the main overpopulation problem, all these other mentioned problems would be automatically solved too. I am ready to help. I agree whole. Overpopulation and an inability it seems to be content to not have more kids but to jut maintain a level of population that is sustainable is our number one problem driving climate change and all these other thing going on. We need to take action in legislation and start punishing people for having more than two offspring (exception if one dies). Perhaps a very regressive tax system which rewards for having les;;;;s than two children and punishes steeply for having more than two children. and automatic penalties in taxes for. We must stop overpopulation before it destroys all of us. ZERO POPULATION GROWTH!